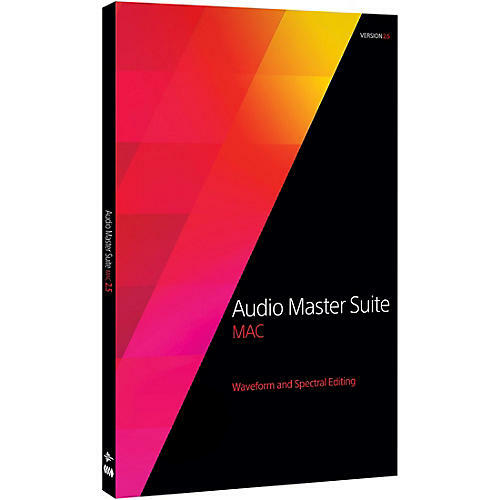 Audio mastering engineers around the world depend on the award-winning SOUND FORGE Pro Mac to generate flawless audio; includes iZotope RX Elements, iZotope Ozone 8 Elements. Record high-resolution audio at 24 bits with sampling rates as high as 192kHz. Customizable window layouts give you access to flexible hardware routing, adjustable metering utilities and up to 32 channels of simultaneous recording. Set everything up, check your levels and click record. Precisely calibrated AES/EBU loudness meters help you make use of the entire dynamic range for broadcast audio while you ensure compliance with standards such as the CALM Act (Commercial Advertisement Loudness Mitigation Act). Flexible meter positioning puts you in control of the location and orientation of the meters. Interoperability with SpectraLayers Pro 4 SOUND FORGE Pro Mac 3 offers a complete round-trip workflow with SpectraLayers Pro 4. Experience the best of both waveform editing and spectral editing. SOUND FORGE Pro SpectraLayers Pro 4 Special iZotope plug-ins for Mac SOUND FORGE PRO AUDIO EDITING & MASTERING SOUND FORGE is the application of choice for audio editors. Precise recording, intuitive workflows, professional signal processing and a variety of effects make SOUND FORGE one of the most exceptional audio editors on the market. SPECTRALAYERS PRO 4 AUDIO RESTORATION & SOUND DESIGN SpectraLayers™ Pro 4 sets new standards in spectral audio editing. Color-coded layers, precise selection tools, and an easy copy and paste editing workflow are all supported under the hood by impressive performance enhancements. Immerse yourself in SpectraLayers Pro for an audio restoration and sound design experience that will open new horizons on every launch. RX ELEMENTS BY IZOTOPE Audio restoration in exceptional quality. Award-winning tools for audio restoration enable you to work with total precision. RX Elements offers comprehensive editing options, spectral editing and also contains four essential plug-ins for real time audio editing.